I walked into an 8th grade classroom finishing up writing and solving systems of equations given word problems. They began this learning last week. I overheard the teacher and a student having a discussion about drawing pictures to represent the problem versus trying to write the equations. This told me that the weekend was too big of a gap from the examples that they had done last Thursday (they had a sub on Friday). I briefly walked over to a different student and noticed that she only had one equation to represent this cars and motorcycles problem. She defined the variables correctly, but had written a single equation that mixed the information about the number of wheels and the total number of vehicles. She hadn’t made sense of what her equation actually meant. But, I thought that maybe it goes further than that. It’s nothing fancy or mind-blowing…I just want to see if this gives them a structure to look for when they are deciding how best to represent a given scenario. I want them to see that there are two unknowns in the third case, and that they need to create an algebraic representation for Eli’s savings and for Lucas’ savings. I’m also wondering if I should remove the headings from the table before we ask them to notice and wonder??? We’re going to try this tomorrow…so I’ll let you know how it goes. I was supporting an 8th grade teacher that was implementing the Classifying Solutions to Systems of Equations formative assessment lesson from Mathematics Assessment Project. The students had not yet worked with linear equations in any form other than slope-intercept form. The students already understood the different types of solution a system might have. I’ve encouraged this teacher to build a strong foundation for students being able to create and complete a table of values. Creating a table should be a go-to strategy for students if all else fails. I interrupted the class to pose a question. Me: What do we know about an equation that is solved for y? Students: We know the y-intercept and we know the change in y over the change in x. Me: What do you notice about this equation? Students: It’s solved for x. Me: What do you think that might tell you? Students: The x-intercept???? (Imagine a questioning tone here…) Is that a thing? Me: Yes it is a thing. What about the coefficient of the y? What do you think that might tell you? Me: Yep. Let’s pull up Desmos and check it out. I remember being a math student that naturally made these sorts of connections~that if something happened mathematically one way, I could predict what would happen in an opposite direction. I want the students to know and wonder about these things for themselves. But, I think we need to make it obvious to them sometimes that they can do this thinking on their own. I’m a little late…but, here’s my week 2 “My Favorite” post for the Explore MTBoS blogging initiative. The Charles A. Dana Center out of The University of Texas at Austin has put together a great set of tasks for eliciting student thinking. One of my favorite tasks that I have used with 8th graders (for years) is called Mosaics. Because we spend time making sense of the patterns from the Visual Patterns site, this task works well as an independent assessment task. I particularly like question one in that it asks students to represent the problem in at least three ways–they are not told how to represent the problem. I like to see if they will use a table, graph, etc. Also, it’s interesting to see how different students “see” the pattern growing and how they choose to show that thinking. 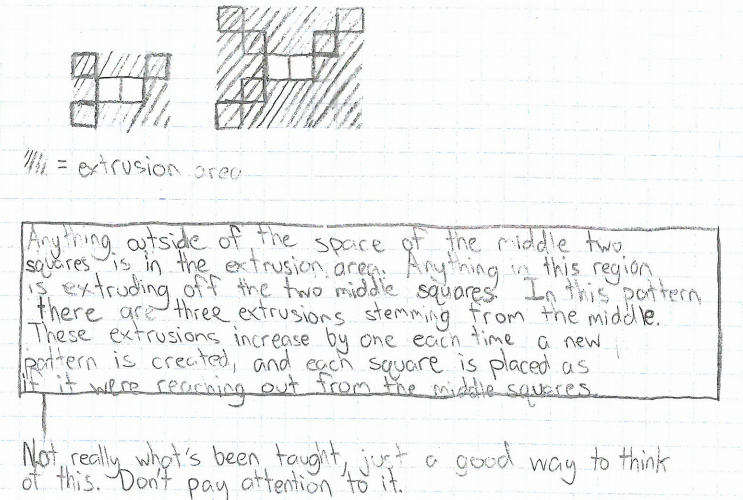 Here is a link to additional student work from this task. We’ve used this task, along with the student work, as part of our back-to-school professional development on using a examining student work protocol. Dana Center tasks are not a free resource. You can purchase a book of these tasks here, or on CD here. You won’t know this, but this is my 2nd draft of this post. (I even changed the title.) I went running half way through what I was trying to write and everything that I really wanted to say came to me so clearly. I should have stopped and recorded the words that were so fluidly coming to mind, but I didn’t. It made me wonder, however, about why the words that I was struggling to string together for the original post came to me so easily while out running. I decided that my mind was free of the clutter of trying to say the right things and in the right way–allowing me the ability get at the heart of what I wanted to communicate. This–I decided–is the reason that balance problems are a great way for students to interact with the reasoning of equation solving. They are free of the clutter of the procedures and notation and get at what is really going on. Yesterday, I read Michael Pershan’s post about the use of balance problems (which I consider a sort of puzzle) as part of a series on solving equations. I used this “balance reasoning” that he referred to in order to make the connection between what students know how to do naturally and the skill that I wanted them to walk away from 8th grade being fluent in–solving equations. 8th graders have done a ton of work solving equations, but still, many are not fluent. I used these puzzles during warm-ups without expecting any sort of equation writing/solving. Over the course of time…I wanted the students to begin to ask why we were doing them when they were so easy. I used the balance problems from EDC, but I also made great use of some of the resources found here. 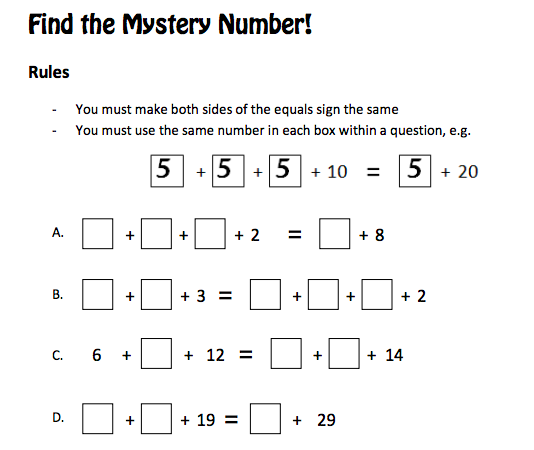 One resource I used from this site is Mystery Numbers. Students were able to use guess and check, along with “balance reasoning”, to find the correct value. The “mystery” of these problems can be ramped up rather easily and foster the need for a more sophisticated strategy. I began having the students simply write the equation that could be represented by the mystery number equation. The students had been wrapped up in the fact that these were at once so easy, but now not so much. I used the mystery number problems written side by side with its algebraic representation in order to show the students how the “balance reasoning” related to the algebraic manipulation. Students seemed to invest in this process because it was connected to something that they knew they could do. I talked with them a lot about how math is all about learning more and more sophisticated ways to represent problems–even ones that they could do with an elementary level of understanding. I believe it was the connection to a task that they found doable-that allowed them to find the algebra less intimidating. Additionally, I used problems like this from Sarah Rubin.